Since December 2017, Novatek has delivered 10 million tons of Yamal LNG to market. Novatek, Russia’s largest privately-owned natural gas producer, has signed several contracts for construction on its Arctic LNG 2 project, even as the company announces a new milestone at its Yamal LNG facility. Since that facility opened in December 2017 the company has delivered 10 million tons of liquefied natural gas to markets in Europe and Asia. Novatek and its shipping partners use a fleet of specialized Arc7 LNG carriers throughout the region’s icy waters and have thus far conducted 136 shipments, the company announced. In order to further expedite shipments to Europe Novatek began a cooperation with Tschudi shipping company to transfer the majority of its gas in the waters off the North Norwegian coast at the end of 2018. This week the company also signed a number of construction contracts, which indicate that its development of the new Arctic LNG 2 facility is moving ahead as scheduled. This includes agreements with Siemens, a German conglomerate, as well as Saipem of Italy and Renaissance Heavy Industries of Turkey. The new LNG plant, scheduled to open by 2023, has a capacity of 20 million tons per year, more than doubling Novatek’s current Arctic output, and will elevate it to one of the world’s largest LNG-producing companies. In its first full year of operation Novatek continues to optimize its complex logistics operations surrounding the Yamal LNG facility. In addition to transferring LNG near Honningsvåg, which will see up to 140 ship-to-ship transfers by the end of May, the company is also becoming more proficient at navigating the Northern Sea Route towards Asia during the depths of winter. 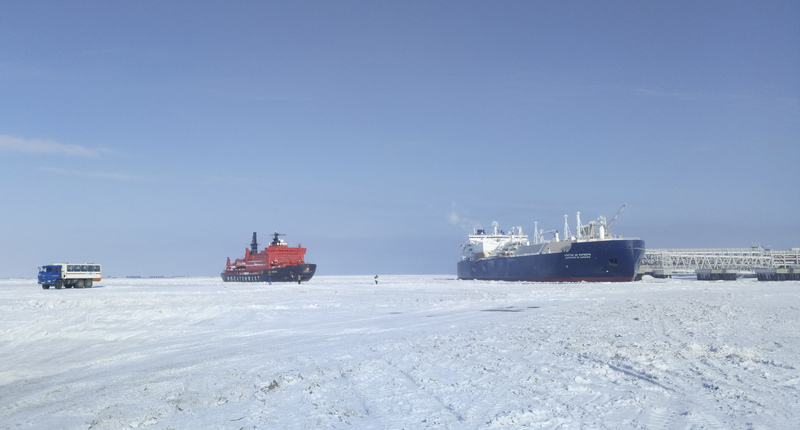 Last month, two new Arc7 ice-class carriers, one for LNG and one for condensate, made the first non-icebreaker assisted voyage along the NSR from Asia to the Port of Sabetta during winter. The Boris Davydov and Boris Sokolov left South Korea at the beginning of January and arrived at the Yamal facility around two and half weeks later. While such type of journeys during the winter are not yet planned on a regular basis, according to Russia’s Ministry of Transport, Novatek will over the coming decade routinely conduct voyages to Asia even during the winter months as the majority of its LNG production is contracted for delivery to Asia. In an effort to optimise Novatek’s access to and supply of the Asia-Pacific region the company recently signed a Memorandum of Understanding with the Saibu Gas Company for the use of its Hibiki LNG terminal in Japan. “The Asia-Pacific region is a priority destination for Novatek’s LNG projects. Our ability to use the Hibiki terminal will help diversify our customer base and increase the flexibility of deliveries to the premium LNG markets,” noted the company’s First Deputy Chairman of the Management Board Lev Feodosyev. Novatek is making rapid strides to begin construction of its second Arctic LNG project. Earlier this week it signed a contract with Siemens to supply gas compressors and related equipment for the new project. Interestingly, some of the equipment will be manufactured in Russia, rather than being imported as was the case with the Yamal LNG plant. In contrast to Yamal LNG, which was constructed on land, the new project will employ gravity-based structures, which are engineered platforms towed into place and then intentionally sunk in shallow waters to serve as foundation. In this respect, Novatek signed a USD 2.5 billion agreement with Saipem and Renaissance Heavy Industries to supply the engineering, materials, construction, towing, and installation of the platforms. Construction on the facility is slated to begin this summer with a projected opening of the first LNG train or production line with a capacity of 6.6 million tons of LNG by 2023.